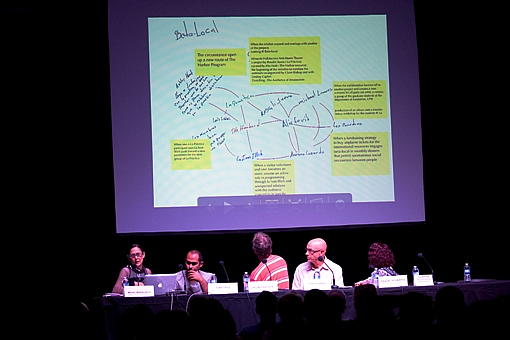 This past May, the Museum of Contemporary Art (MoCA) in North Miami held the New Methods/Nuevos Métodos/Novos Métodos symposium, which focused on exploring the work strategies of eight independent Latin American art organizations that do not follow the traditional models of art institutions. Those organizations were created directly by players in the art field — artists for the most part-- and their profiles differ to such an extent that one has to really search to see what they have in common. In this regard one can say that they have all adopted open, relatively hybrid and dynamic operating structures focusing on contemporary art practices. They seek to address the specific needs of the settings in which they act, through work methods and procedures that shift and change in keeping with the initiative of the players involved in them. Similarly, over time and on their own initiative, these organizations have established mutual exchange mechanisms, both on a one to one basis and as a whole. These characteristics are the reason why they were brought together in the symposium under an umbrella for reflection that is more or less common to all. SOMA (Mexico City), a space for contemporary art devoted, according to its own definition, to four lines of work or projects: an education program to foster artists’ professional development; a forum for weekly talks, discussions and events; a system of residencies for Mexican and international artists, and an international summer program for artists, curators and art historians conducted in English. PROYECTOS ULTRAVIOLETA (Guatemala City), conceived as a multifaceted platform for experimenting with contemporary art that has an exhibition space and organizes forums, art classes, and concerts for young people, among other activities, while also conducting a residency program for artists and seeking to serve as a liaison between the Guatemalan contemporary art scene and other cities. BETA-LOCAL (San Juan, Puerto Rico) refers to itself as “a study and promotion program, an experimental education project and a platform for production and critical discussion”, which it seeks to provide through three main avenues: a year-long program focusing on artistic and esthetic practices and made up of participants from different fields; an international residency program for artists and other cultural producers, and a program of open activities such as talks, workshops, etc. CASA TRES PATIOS (Medellí­n, Colombia), whose mission is to promote contemporary art in Colombia and contemporary Colombian art abroad, which it does by holding exhibitions in the gallery on its premises and through publications, talks, classes and workshops, while also conducting a residency program for artists. Casa Tres Patios has thus become a site for disseminating art, engaging in intellectual debate and professionalizing contemporary art practices. LUGAR A DUDAS (Cali, Colombia) also focuses on exhibiting contemporary art as one of its main ways of promoting and researching current art processes, which it combines with talks, conferences and other activities designed to foster a critical reflection on art. Another two lines of action have been the development of a documentary center for contemporary art and a residency program for national and foreign artists and researchers. KIOSKO GALERIA (Santa Cruz, Bolivia), which is both an exhibition space and a project aimed both at extending art practices in Bolivia and promoting exhibitions of contemporary Bolivian art abroad. Kiosko also conducts workshops for creators and a simultaneous residency program for two artists, one Bolivian, the other foreign, in order to foster new forms of exchange and dialogue on two levels: between artists themselves and between artists and the public. CENTRO DE INVESTIGACIONES ARTISTICAS (Buenos Aires), which mainly works as a center for meetings and dialogue to promote a critical reflection on art. To this end, the Center conducts two basic, inter-related programs: international residencies for artists and researchers on one hand, and courses and seminars on the other. CAPACETE (Rí­o de Janeiro), whose profile is that of a multifunctional agency focusing on research and promotional projects in the spheres of art and visual culture in general, including cinema. It conducts a residency program for artists and different mobile projects. Its wide range of activities also encompasses publishing efforts. The following representatives of those organizations attended the event: Yoshua Okon and Eduardo Abaroa (SOMA); Stefan Benchoam and Emiliano Valdés (Proyectos Ultravioleta); Michy Marxuach and Tony Cruz (Beta-local); Tony Evanko (Casa Tres Patios); Sally Mizrachi (Lugar a Dudas); Raquel Schwartz and Roberto Valcárcel (Kiosko Galerí­a); Roberto Jacoby and Judi Werthein (Centro de Investigaciones Artí­sticas); and Helmut Batista and Amí­lcar Packer (Capacete).